We are serious about healthcare technology innovation. We continually explore how to improve healthcare through technology. We found that a different set of hospital systems-known as clinical information systems, support better patient care and outcomes. Because if you are a doctor or a nurse in the daily trenches of caring for the sick, you know that a patient’s clinical information— her medical history, lab results, consult notes, medications, etc, gives you better chances to help treat or cure her condition. Because deep down, you know that the current hospital systems are not the tools you hoped to support your practice skills. Because when you all look at the enormous files of medical records, you know there's an important reason for keeping them but you say to yourself, there is better use for them instead of just collecting dust. The good news is we may have the answer that can help you. No, this is not the usual system that only tracks patients and their corresponding hospital bills. 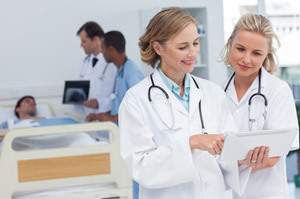 This type of technology enables the capture, storage, retrieval, sharing and presentation of aggregated clinical patient data across multiple systems and different departments; that bring information into the hands of clinicians such as yourself (and empower researchers) seeking to provide the best possible care, ensure the safety of the patient and achieve better patient outcomes. Ask us and learn more about MERX™ Clinical Information Systems. This is technology that can equip hospital owners and executives with insights on how and where to invest resources and services necessary to become centers of excellence valued by their clients. Quite simply, what we offer are next-generation hospital systems that support your goal of achieving quality care. Learn more. Ask us on how MERX™ Clinical Information Systems can help raise your healthcare services to the next level. Try our Free 3-month Trial! Medcurial EMR enables health providers to access health information whenever and wherever a patient gets care, improving coordination and continuity of care for better informed decision- making. MeRx is your next-generation system that offers everything you need to run your hospital more efficiently while ensuring comprehensive patient-centric management through integrated clinical applications. LabMerge allows you to manage your clinic’s multiple laboratory systems within one console - integrating all orders and results into the patient’s record while significantly reducing manual coordination between all users. We make it available today! At Medcurial, we design with the doctor in mind and with improved patient outcome as goal. Using the best technology isn’t enough. An application should be intuitive and easy to use - something that would blend and not interfere with the physician’s day-to-day practice. "Without significant changes to how clinical care is delivered, hospitals - despite operational improvement programs, will not be able to achieve the 5- 10 % reduction in operational costs that most experts believe is needed to cope with today’s economic challenges."